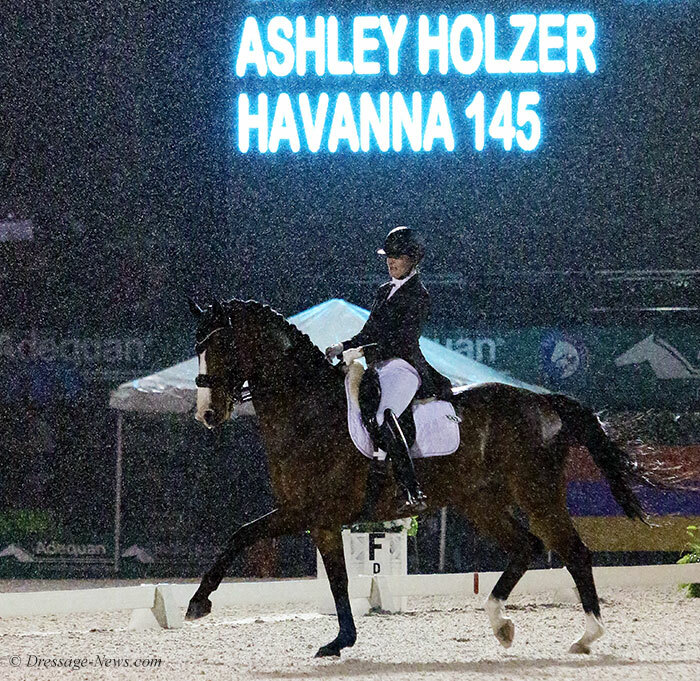 WELLINGTON, Florida, Feb. 23, 2018–Ashley Holzer and Havanna won the Adequan Global Dressage Festival World Cup Grand Prix Freestyle in heavy rain Friday night but will skip a chance to go to the Final in Paris in April despite posting the second highest score in a musical performance in North American qualifying. 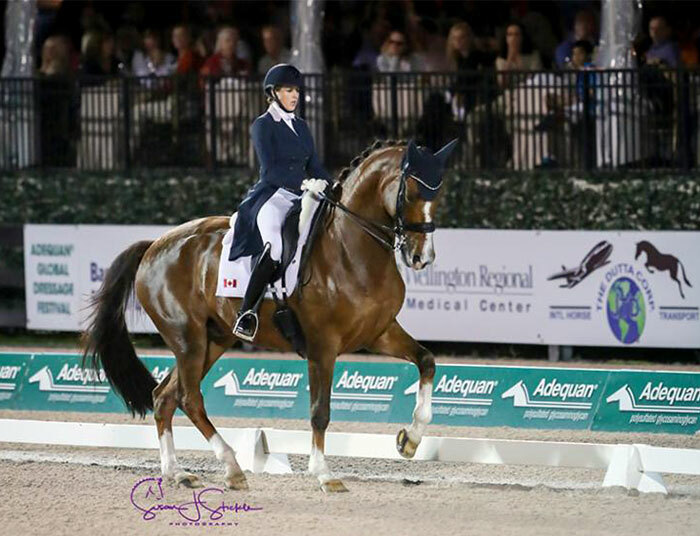 Ashley, a three-time Olympian for Canada but who now rides for the United States, said she is focused on earning a place on the American squad to go to Europe over the summer for selection of the team for the World Equestrian Games at home in Tryon, North Carolina. “The best thing about tonight was that Havanna came out after a strong performance last night and she again tried her hardest,” said Ashley who is based in New York and Wellington. “Thomas [Baur, AGDF director of sport] saw her a year ago and told me she’d do it–and he was right. She’s a good egg and she tries her hardest; every time I ask her to try harder, she says, ‘OK.’ It’s testament to her incredible upbringing and character. Canada’s Brittany Fraser and All In, who train with Ashley as did three other American and Canadian combinations in the class of 12 starting pairs, placed second on 75.850 per cent that is not enough to earn a Paris invitation at this stage. The ride by Britanny on the 13-year-old All In was their highest ever freestyle score. Fraser has had the Tango gelding since he was five, climbing the ranks together, and they have been competing at Grand Prix for three years. 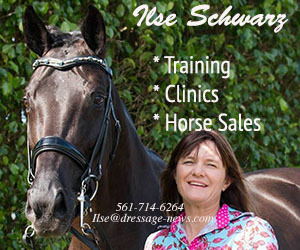 Shelly Francis of Loxahatchee, Florida rode Doktor in this competition for third place on 73.560 per cent but has the highest result on her other Big Tour horse, Danilo, who is the top of the North American standings. 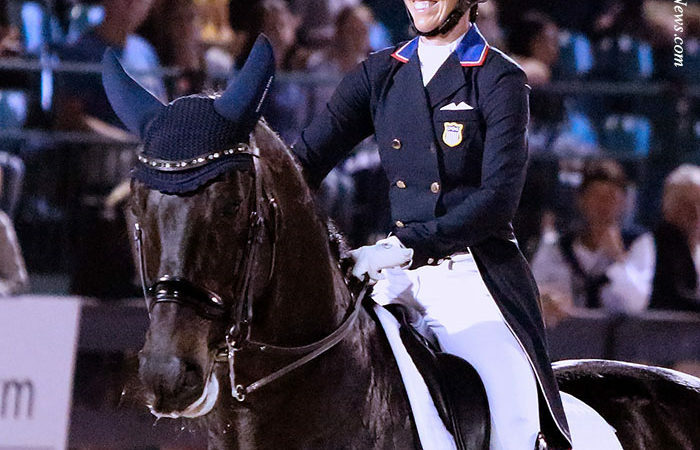 However, Laura Graves of Geneva, Florida and Verdades have the highest freestyle score, 84.675 per cent, but need another result to clinch one of the two starting spots reserved for North America. The last chance to do that will come next week with the Palm Beach Dressage Derby in Wellington as the wrap-up event for this season of the annual world championship. Havanna (Hochadel x Rogdau) was bought by Diane Fellows just over a year ago from Jessica and Benjamin Werndl in Germany as a U.S. team prospect for Ashley. Brooks, Jacqueline CAN D Niro Ret.